Geographic and segment net sales: Percentage Change 2014/2013 2013/2012 Years Ended December 31, Constant Currency Constant Currency 2014 2013 2012 Reported Reported Geographic sales: United States $ 6,558 $ 5,984 $ 5,658 9.6 9.6 5.8 5.8 International 3,117 3,037 2,999 2.6 5.7 1.3 6.0 Total net sales $ 9,675 $ 9,021 $ 8,657 7.3 8.3 4.2 5.9 Segment sales: Orthopaedics $ 4,153 $ 3,949 $ 3,823 5.2 6.3 3.3 5.4 MedSurg 3,781 3,414 3,265 10.8 11.7 4.6 5.5 Neurotechnology and Spine 1,741 1,658 1,569 5.0 6.2 5.6 7.7 Total net sales $ 9,675 $ 9,021 $ 8,657 7.3 8.3 4.2 5.9 STRYKER CORPORATION 2014 Form 10-K 11 Dollar amounts in millions except per share amounts or as otherwise specified. Net sales increased 7.3% in 2014. In 2014 net sales grew by 7.8% as a result of increased unit volume and changes in product mix and 2.5% due to acquisitions and were negatively impacted by 2.0% due to changes in price and 1.0% due to the unfavorable impact of foreign currency exchange rates. Excluding the impact of acquisitions, net sales increased 5.8% in constant currency. Net sales increased primarily due to higher shipments of instruments products, trauma and extremities products, endoscopy products, neurotechnology products, medical products, and the impact of acquisitions. Net sales increased 4.2% in 2013. In 2013 net sales grew by 6.5% as a result of unit volume and changes in product mix and 0.8% due to acquisitions and were negatively impacted by 1.4% due to changes in price and 1.6% due to the unfavorable impact of foreign currency exchange rates. Excluding the impact of acquisitions, 2013 net sales increased 5.1% in constant currency. Net sales increased primarily due to higher shipments of trauma and extremities products, neurotechnology products, hips and endoscopy products. In the United States net sales increased 9.6% in 2014 after increasing 5.8% in 2013. In constant currency, International sales increased 5.7% in 2014 after increasing 6.0% in 2013. 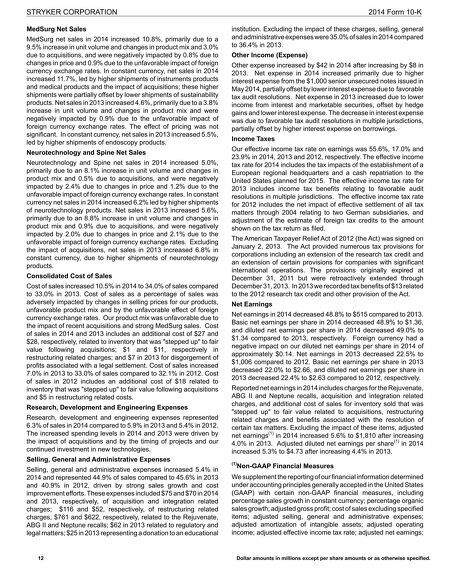 Supplemental geographical sales growth information Percentage Change Percentage Change Years Ended December 31, U.S. International Years Ended December 31, U.S. International 2014 2013 As Reported Constant Currency As Reported As Reported Constant Currency 2013 2012 As Reported Constant Currency As Reported As Reported Constant Currency Orthopaedics Knees 1,396 1,371 1.8 % 2.7 % 4.3 % (3.5)% (0.7)% 1,371 1,356 1.1 % 2.6 % 3.4 % (3.3)% 1.1 % Hips 1,291 1,272 1.5 % 2.7 % 6.1 % (4.2)% (1.4)% 1,272 1,233 3.2 % 6.0 % 7.2 % (1.4)% 4.5 % Trauma and Extremities 1,230 1,116 10.2 % 11.4 % 14.8 % 5.1 % 7.7 % 1,116 989 12.8 % 15.1 % 18.4 % 7.2 % 11.8 % Other 236 190 24.0 % 25.2 % 37.4 % (7.6)% (3.7)% 190 245 (22.5)% (20.9)% (19.7)% (28.3)% (23.4)% ORTHOPAEDICS 4,153 3,949 5.2 % 6.3 % 9.4 % (1.1)% 1.7 % 3,949 3,823 3.3 % 5.4 % 6.2 % (0.6)% 4.4 % MedSurg Instruments 1,424 1,269 12.2 % 13.1 % 14.8 % 5.7 % 8.8 % 1,269 1,261 0.6 % 1.9 % 0.7 % 0.6 % 5.1 % Endoscopy 1,382 1,222 13.1 % 14.2 % 13.3 % 12.6 % 16.2 % 1,222 1,111 10.0 % 11.0 % 11.4 % 6.5 % 9.9 % Medical 766 710 7.9 % 8.8 % 9.3 % 2.2 % 6.7 % 710 691 2.8 % 3.1 % 3.4 % 0.3 % 2.0 % Sustainability 209 213 (1.9)% (1.9)% (1.8)% nm nm 213 202 5.6 % 5.6 % 5.8 % nm nm MEDSURG 3,781 3,414 10.8 % 11.7 % 11.7 % 7.9 % 11.5 % 3,414 3,265 4.6 % 5.5 % 5.2 % 2.9 % 6.4 % Neurotechnology and Spine Neurotechnology 1,001 915 9.4 % 10.9 % 11.2 % 6.7 % 10.4 % 915 842 8.7 % 11.4 % 11.2 % 5.1 % 11.8 % Spine 740 743 (0.4)% 0.3 % (1.6)% 2.5 % 5.2 % 743 727 2.1 % 3.4 % 1.8 % 2.9 % 7.2 % NEUROTECHNOLOGY AND SPINE 1,741 1,658 5.0 % 6.2 % 5.0 % 5.1 % 8.5 % 1,658 1,569 5.6 % 7.7 % 6.4 % 4.3 % 10.0 % nm = not meaningful Orthopaedics Net Sales Orthopaedics net sales in 2014 increased 5.2%, primarily due to a 6.2% increase in unit volume and changes in product mix and 3.0% due to acquisitions. Net sales were negatively impacted by 2.9% due to changes in price and 1.1% due to the unfavorable impact of foreign currency exchange rates. In constant currency, net sales increased by 6.3% in 2014, primarily due to increases in trauma and extremities products and the impact of acquisitions. 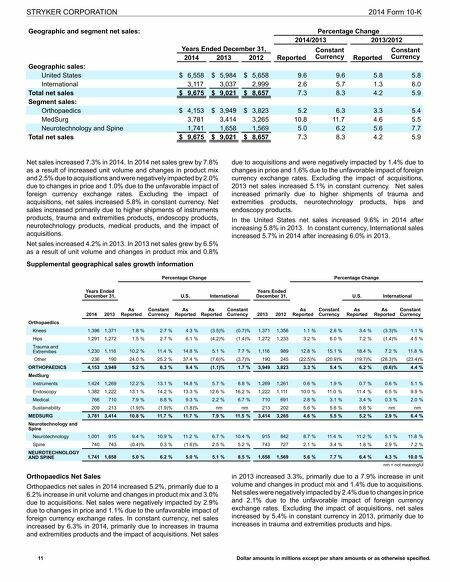 Net sales in 2013 increased 3.3%, primarily due to a 7.9% increase in unit volume and changes in product mix and 1.4% due to acquisitions. Net sales were negatively impacted by 2.4% due to changes in price and 2.1% due to the unfavorable impact of foreign currency exchange rates. Excluding the impact of acquisitions, net sales increased by 5.4% in constant currency in 2013, primarily due to increases in trauma and extremities products and hips.